This picture is from a flooring ad in an Irish interiors magazine. 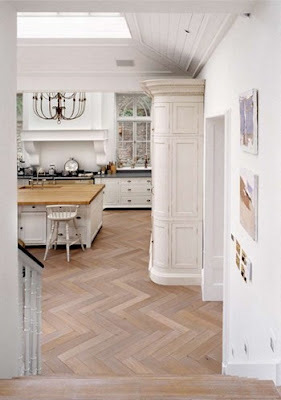 I do like the floor which is big scale parquetry and it is unusual in that it has a more bleached look than most parquet floors you see. I really like the kitchen though - it is so enormous the Aga looks tiny. I love the way you can see the light fitting from the stairs, the mix of surfaces, windows and what looks like an enormous skylight over the island. I wonder whose kitchen it is . . .